I read this article and found it very interesting, thought it might be something for you. The article is called Semi-Sweet Vegan Chocolate Chips – Which Are Best? and is located at http://www.gardendish.com/semi-sweet-vegan-chocolate-chips-best/. These were the only vegan options available to me. I was disappointed that neither NESTLÉ® TOLL HOUSE®, nor Hershey’s® semi-sweet chocolate chips were vegan. But the fact that my grocery store carried three options – and my store is not a specialty or natural foods store – was pretty good in my view. This was the first in our series of taste tests, and I had no idea what a clamoring of excitement it would generate in a group of over-40-something adults. One by one as the guests arrived, they were quickly shuttled over to the tasting table by other guests who had already completed their voting and were eagerly awaiting the overall results. A crowd formed around the tasting table. Tasters who had already voted anxiously watched the faces of others still in the act of tasting, seeming to look for a hint of what the taster was thinking. Each taster voted for their first, second, and third choices – except for one person who clearly didn’t read the instructions. We had to conduct an interview to capture her answers. After the much anticipated votes were tallied, there were two clear winners and one obvious loser according to our group’s tastes. The winners were Sunspire Semi-Sweet Chocolate Organic Chocolate Chips and Enjoy Life ® Mini Chips. The Sunspire Grain-Sweetened Chocolate Chips didn’t please many taste buds. Details from the voting are in the table below. 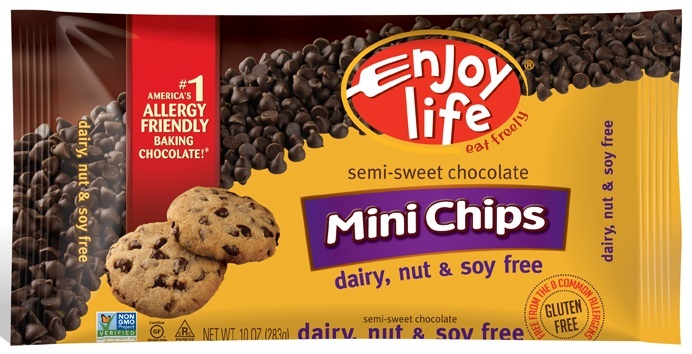 I made chocolate chip cookies from the Enjoy Life Semi-Sweet Chocolate Mini Chips, and our guests proclaimed them to be equally delicious baked in a cookie. You can find the recipe for these Mmmm Chocolate Chip Cookies in the recipes section of the website. I think your vegan baking will be a winner with either of these top vote-getting vegan chocolate chips. Let me know how yours turn out in the comments section below. 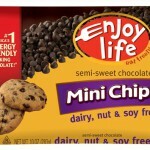 * The image of the Enjoy Life Mini Chips was provided by and is used with the permission of Enjoy Life. ** As of 11/18/14 these seem to be no longer available. They are not listed on the Sunspire™ website.